HEALTHY DIETS AND SCIENCE: Review of my book "Cholesterol and Saturated Fat Prevent Heart Disease" by Ilona from the "Big Fat Blog"
Review of my book "Cholesterol and Saturated Fat Prevent Heart Disease" by Ilona from the "Big Fat Blog"
Here's a review of my book Cholesterol and Saturated Fat Prevent Heart Disease by Ilona from the "Big Fat Blog". 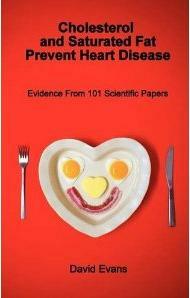 There is no correlation between high cholesterol levels and heart disease. Cholesterol and saturated fat actually lower the risk of heart disease. High carbohydrate diets are associated with an increased risk of heart disease. Diets high in polyunsaturated fats (vegetable oils) are associated with increased chronic diseases rates. You can find more studies and information on David Evans blog: Healthy Diet and Science (there's even a page with recipes). I am very happy that there are more and more people who dare to speak out against "medically and politically correct wisdom" and question the validity of the current "healthy diet" hypothesis. For example this article by Dr. Dwight Lundell, Heart Surgeon. I am also very happy that the science of nutrition functions less and less like a religion (based on beliefs), but is based more and more on actual science, were hypotheses and theories are questioned, and from associations, correlations are drawn. Science should not be based on suppositions and opinion. Observations have to be thoroughly tested. "Forming hypotheses is one of the most precious faculties of the human mind and is necessary for the development of science. Sometimes, however, hypotheses grow like weeds and lead to confusion instead of clarification. Then one has to clear the field, so that the operational concepts can grow and function. Concepts should relate as directly as possible to observation and measurements, and be distorted as little as possible by explanatory elements."